Grand Cru Shiraz Well-balanced with lively aromas of black pepper, plums and toasted oak. A favor..
Valpola - Formally Valpolicella An intense, deep-colored red wine boasting a velvety yet fruity f..
A hint of violet is present in the bouquet, typical of this variety. 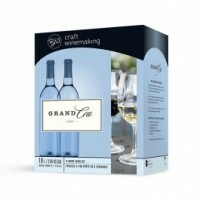 It’s superbly enhanced wi..
A blend of a variety of the best white grape varieties, this full-flavored and food friendly wine is..
A medium-bodied wine with a crisp, green apple bouquet, and hearty flavor. This is a true classic wh.. Extremely spicy in flavor and aroma, this wine will tantalize any palate. It pairs well with all kin..
A clean, refreshing and food friendly white wine offering a light, fruity aroma with green, herbal f..
A complex blend of grape varietals, this rich wine is dark in color and high in tannin, leaving a hi..